Join Jennifer Maddrell at http://edtechtalk.com/live/D4L for her next Designers for Learning On Air Event on Monday, February 4, 2013 at 19:00:00 UTC. Drs. Kristina Lambright and Allison Alden will join Jennfer for a live discussion of their research on service learning. Join us in the National Capital Region for the 2013 CNIE-RCIÉ conference, hosted by Carleton University. May is the perfect time of year to visit Ottawa as it is the start of our world famous Tulip Festival and the start of Ottawa’s active summer season of cultural events and activities. The official conference hotel is the historical Chateau Laurier, located in the heart of the city surrounded by the Byward Market, the Canadian Parliament, and the locks of the Rideau Canal. Come experience everything the Nation’s Capital has to offer. CNIE-RCIÉ connects educators, administrators and practitioners in a bilingual, pan Canadian network. Our group promotes research and advances practice in both open and distance education and the use of educational technologies. CNIE-RCIÉ addresses all educational contexts, including K-12, post-secondary, and private sector. This year’s CNIE-RCIÉ conference encourages us to consider and think critically about the rapid changes taking place both in face-to-face and online classrooms. The availability of technology has exploded, and our current understanding of how learning best takes place suggests that we need to create environments that are learner-centered, active and participatory. How can we create these environments in our classrooms? What works well? And, in an era with significant fiscal challenges, how can we succeed long-term? We will explore these questions and facilitate discussion. Educational Technology: Possible areas include classroom design innovations, engagement technology, audio/visual tools, software, and new educational technology initiatives. Teaching and Learning: Application of pedagogies in online, blended, or hybrid courses. Innovations in Education: Disciplinary application of old practices in non-traditional ways. Research: Research studies and theoretical explorations of educational technology pedagogy and practices. Please see the attached call for proposals for details. 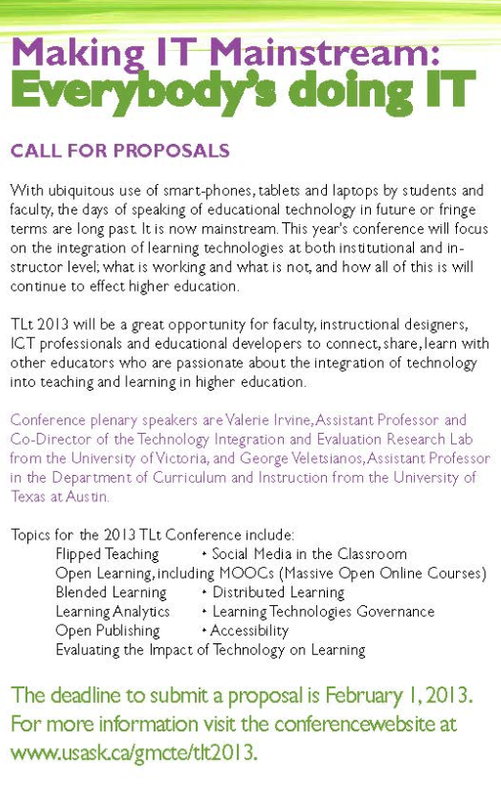 The TLt conference this year is hosted by the University of Saskatchewan. Here is the call for papers. Hope to see you there!